I finally made it under the wire. This is an entry for Ken Broad’s Fictional Campfire blog. His challenge was to write a story about an antique object that was fit for Halloween. He requested that we try to keep it under 500 words. I’m sorry that I didn’t accomplish that, but Priscilla told me she’d bite me if I wrote such a few words. I’m not ready to be … well, vampirized. Warning: At least three people have reported being “creeped out” by this story. Caveat lector (Let the reader beware)! There was something special about it. “You’ll scare her half to death, Jack,” Priscilla declared. “Honestly, look at yourself…with all those little bits of flesh still on the bones, hollow eyes, drooling head. Jack Porter grimaced, as he looked down at himself. He hadn’t thought of how he looked; he was just responding to the pull from…from her. He struggled to stay where he was; without a real body it wasn’t easy. “What can I do?” he asked in a hoarse voice. As Priscilla thought, he admired how the moon shone on her head, making it look like silver. The concept of time was fading from Jack’s memory, but the urgency of the pull was real. “Well, it’s murder staying on this plane so you better make up your mind pretty quick.” Priscilla stomped off down the street, her black outfit bristling with indignation. Jack stood in the shade of the big cedar bushes and thought. Not having brains was proving bothersome, but finally he had an idea. Flicking a worm out of one eyehole he walked slowly after Priscilla. “What about if we make her think today is Halloween?” he said to Priscilla, who was hungrily eyeing a drunk staggering down the street after a late night of partying. Jack stared at her, his dried eyeballs nearly falling out of his head. He rescued one and let the other go. He couldn’t see out of them anyhow, so no use being sentimental. Priscilla licked her lips hungrily. Jack just shook his head so vigorously that the lobe of his left ear flapped off. Priscilla got sulky. “I wish I’d never agreed to help you, even if I did eat your brains. They were still fresh and you didn’t need them anymore. Jack silently started walking towards Norma’s house. He wasn’t sure how long after the funeral it was, but he just had to see her one more time and let her know…what? He had forgotten what he was going for. Then he dimly thought perhaps it wasn’t really her he had to see. He wanted to, of course. After all she had been his loving wife for…well, a lot of years anyhow. But being dead…or rather, undead, changed things, changed priorities. “I have an idea,” Jack replied. “The mirror will help. All we have to do is get into the house without being spotted. Jack’s frail memory still managed to get them into the house quietly enough that the sleeping Norma didn’t hear them. Jack led the way to the little room that he and Norma had laughingly called his office. It had actually been an ironing room and had only been big enough for an ironing board, a shelf, and a laundry basket. “What kind of a mirror?” Priscilla asked in a whisper. Jack held up a mirror. About the size of a tall picture, it had a frame, beautifully carved and scrolled out of wood, which had then been artfully gilded. Sceptically, Priscilla peered into the mirror; then uttered a little shriek, sticking her fist into her mouth to try to muffle it. Priscilla looked pale. ”I haven’t seen myself like that for nearly a hundred years.” Cautiously, Jack peered around the mirror and laughed again. It was hard to recognize the sophisticated vampire not sporting her Gap black gown and strappy Gucci shoes. Instead, the mirror showed her as a teenager, complete with bobby socks, saddle shoes, poodle skirt and sweater set. Her white blond hair was tied back in a pony tail, and she laughed with delight as she danced with friends. Jack wandered down the hall towards where he fuzzily remembered the master bedroom to be. A full-throated snarl from the bedroom cut her off. 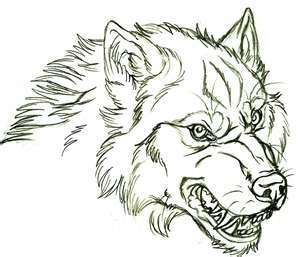 “Ah!” Jack exclaimed as a silver-grey wolf the size of a Bengal tiger erupted through the doorway. “That’s what I had forgotten.” He cackled gleefully as the wolf dived at the fleeing Priscilla. It growled at the terrified vampire, then efficiently slashed her throat. Its hungry tongue lapped greedily, as blood poured from the sliced arteries in Priscilla’s neck. The vampire’s eyes were dull and unresponsive. “To think I used to believe you couldn’t kill a vampire,” Jack exclaimed happily. 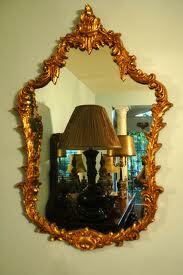 This entry was posted in fantasy fiction, Flash Fiction and tagged antique mirror, cute vampire, dark humor, Halloween, horror, living dead, postaweek2011, vampire, zombie. Bookmark the permalink. Ooh . . . S~P~O~O~K~Y! Creepy, creepy creepy. Happy Halloween. Thanks for dropping by. I’m glad you enjoyed it, HG. Well, at least I THINK you enjoyed it? Well, it creeped me out a bit, but I did enjoy the excellent quality of the writing. You do know how to tell a good spooky tale! Great job, and Happy Halloween! Thanks, Suzi, I appreciate that. Funny thing is, I don’t really enjoy reading horror stories, but I sure do like writing ’em, especially the psychological ones. Happy Halloween! Wow, creeped me out! Really good, Sandra! Especially for someone that doesn’t like horror! Ack! I hope you sleep like a baby, Deb. I’d hate to be the cause of your nightmares. Honestly, I’m wondering if I should pull the story. Unlike Stephen King, I don’t really like to scare people. I was just writing this for fun. (And it IS fun for me – I wonder if this is the other side of a goodie two-shoes. I was a teacher’s pet too :(). Let me know how you sleep, Deb. Thanks for the thorough explanation, Debbie. I’m glad you slept well last night. You’re right; the story is supposed to be scary. I guess I’ll leave it up. Yayyy, I’m glad. And it’s very readable on Kindle? Any more comments you care to make as you read along would be much appreciated. Fantastic story, I loved this! What a great tale, well told! I should mention that I dropped by your blog and read your latest flash fiction. It was excellent and drew me in right away. I was with the guy right away, right to the end. I love where your imagination takes us. Great campfire story. I’m saving it to tell to nieces and nephews next summer. Aw thanks, Janet. That’s a great compliment. This was very good! It is different then your usual work but delightfully creepy for Halloween. Thanks, Billie Jo. I think my husband is influencing my style somewhat by inducing me to watch more horror shows on TV. I’m getting toughened up so to speak. I’m glad you liked it.